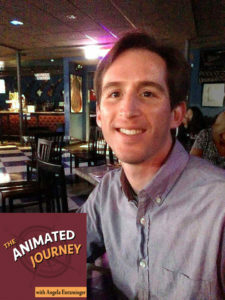 Michigan’s own Sarah Johnson is today’s guest on The Animated Journey Podcast! Sarah shares her experiences growing up in a small town, her love for all things animation (especially Teenage Mutant Ninja Turtles) and how she survived her post-college years freelancing and working hard at pursuing her dream in order to become a storyboard artist, and then the Storyboard Supervisor, for The Fairly OddParents and now one of Nickelodeon’s newest shows, Bunsen Is A Beast. Tune in and hear how to survive and thrive in the animation industry as the Nickelodeon Summer miniseries continues! And…Mabel’s crushes from Gravity Falls were named Xyler and Craz. And that bizarro version of Dipper was Dippy Fresh. Thanks internet! Tim is an amazing and hardworking guy who I first met as a student at Academy of Art University. He originally dreamed of being a fine artist and graduated from Virginia Commonwealth University with a BFA in Illustration/Graphic Design. After working as a freelance artist and graphic designer he decided to switch careers to become a 2D animator. 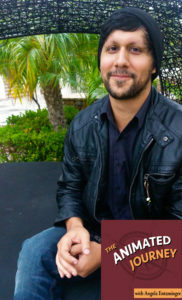 Now he works as a lead animator at Concept Art House, a mobile game studio in San Francisco, CA. He’s also illustrating a children’s book in his spare time that he and the author are hoping to shop around to find a publisher, or publish themselves. I know all of you will enjoy hearing what he has to say and will be inspired by his words of wisdom!